Here, I’m going to discuss flower pollination, and in particular, describe how flowers are adapted to attract their most important partners - that is, how they use pollination syndromes in the pollination process to attract insects. 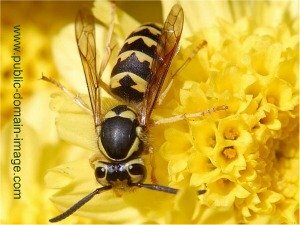 It’s well known that insects have a vested interest in visiting flowers – that is, they’re not merely visiting the flowers with the altruistic intention of performing a passing pollination service. They’re usually gathering nectar and/or pollen. Thus both the plant and insect benefit from their relationship with each other. Given the huge variety of shapes, sizes, features and characteristics of both insects and flowers, and the amazing interdependence, it's essential in nature to understand that one species cannot always compensate for another. This is why it is so important to protect biodiversity, because all creatures play a role in the great web of life. So, how do different flowers attract the right insect for the job? How do flowers vary their features to appeal to their target visitors - i.e. what kinds of ‘pollination syndromes’ have they developed? Let’s take at look at them here. How about the stench of rotting flesh as a pollination syndrome? Humans love fragrance, and so do insects........But different insects like different fragrances! On the one hand, sweet peas have a scent that can charm the bees. Butterflies also like fresh, but very delicate scents. However, this is not the kind of fragrance that appeals to all pollinators. the Dead horse arum lily (Helicodiceros muscivorus) – so called because it produces a scent that mimics a dead animal's (horse’s?) hind quarters, even to the point of converting part of the spathe (the tall spike from the centre) into a hairy tail! and Wild arum (Arum maculatus). From a different plant family, the Orontiods, the Eastern Skunk Cabbage (Symplocarpus foetidus) and Western Skunk Cabbage (Lysichiton americanus), are also said to give off the horrible odour of decaying flesh. 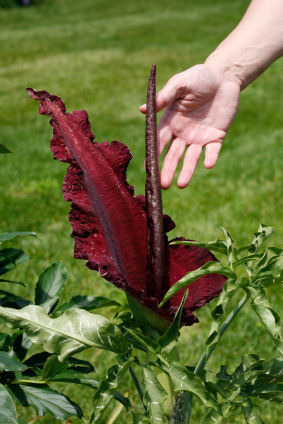 So who or what is attracted to these plants? Primarily carrion flies and beetles (i.e. flies and beetles that are attracted to dead and rotting bodies of animals etc). The time of day also plays a role in attracting pollinators. In some cases, flower pollination actually takes place in the evening, and therefore, scent as a pollination syndrome, has to be stronger in evenings. Flowers pollinated by bats and moths, for example, are strongly scented at night, such as night-scented Stocks, Eryngium giganteum, Evening primrose, Globe Artichoke, Honeysuckle (eg Lonicera ‘Graham Thomas'), Jasmine (Jasminum officinale), Tobacco plant (Nicotiana sylvestris) and Verbena bonariensis. I am often asked during my talks about bees, whether bees prefer particular colours. Like humans, bees are trichcromatic. This means their eyes (like ours) have 3 colour receptors. However, whereas humans base their colour vision on the colour receptors red, green and blue, bees base their colour vision on Ultra Violet, blue and green. So how could this affect flower pollination? Although bees cannot see red, however, they do visit red flowers. Why? Because flower petals have Ultra Violet patterns on them, not visible to humans in normal light, but visible to bees. The patterns are believed to guide the bees onto the flower ‘landing platform’, and then into the flower. 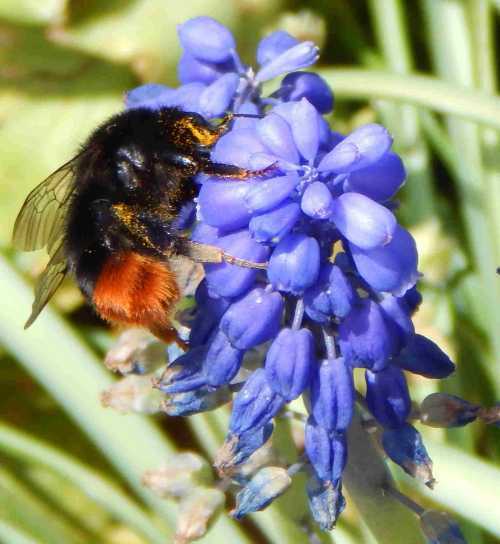 With regard to red flowers, bees may also use other cues, such as scent. However, all in all, it is also thought that bees prefer different shades of blues, whites, and purple flowers. In general, it’s believed that swathes of colour are also more helpful to foraging bees and butterflies, providing a stronger visual signal that suggests ‘plenty of food here’ , and of course, it is more energy efficient for bees and other pollinators to find areas of denser food provision. Flower pollination is also aided by the very shape of the flower, and the way in which insects come into contact with its sexual parts (the carpels and stamen). For example, even within the bee familes, the shapes, sizes and weights of the bees vary, as do the tongue lengths. 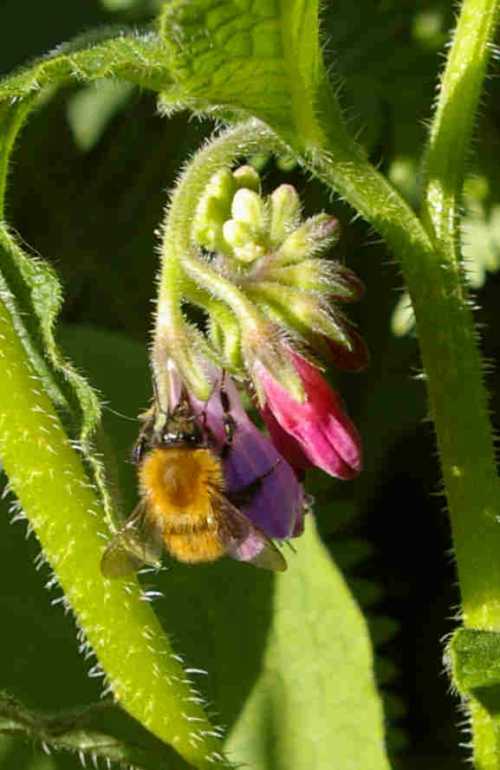 Whilst honey bees have quite short tongues for sucking up nectar, some of the bumblebees have long tongues, meaning they may target deep, tubular shaped flowers. For example, with their furry, roundish bodies, they are ideal pollinators for foxgloves, their coats being efficient catchers of pollen as they make their way up inside the flowers. Flowers have different nectar re-fill rates - yes, once the nectar is taken by one insect, the flower may replenish the nectar ready for the next passing insect. This helps to ensure that a plant can be visited more than once, increasing its chances of pollination. However, insects may cheat the plant! In cases where short tongued bumblebees cannot get at nectar stores in the base of flowers, they may bite a hole, and access the nectar in that way. This is called ‘nectar robbing’. The hole may then be visited by other insects also keen to take the nectar, as the nectar supply is replenished. This is called ‘secondary robbing’. Opinions vary, but some state that flower pollination is not necessarily hindered, because the flower may still be targeted by other bees that are engaged in gathering pollen, rather than nectar. You can read a page about this, and watch some videos here. On the other hand, flowers may cheat insects too! 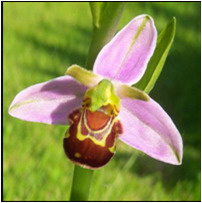 The Bee Orchid (Ophyrys apifera) is believed to have evolved to emulate the appearance of the female bee of the species required to pollinate it. The male bee lands on the female with the intention to mate. In his attempt, the orchid is pollinated. The bee, however, is disappointed! Orchid pollination is not only carried out by bees. Certain beetles such as the beetle Strangalia maculata , are also able to assist in orchid pollination, as they can efficiently access the complex flower structures of some wild orchids. In contrast to flower pollination, which requires the aid of insects, birds or bats, flowers that are wind pollinated (requiring no intervention from other moving creatures), do not have the visual or fragrance cues of other plants. They are generally dull in colour, with no fragrance or nectar to entice an insect. Link to more information about plant pollination, including a diagramatical explanation of the process. Bees are excellent pollinators. Discover more about how bees are adapted for flower pollination, and their importance as pollinators. 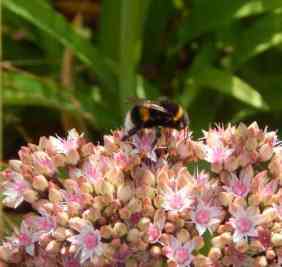 Find out more about the importance of insects for flower pollination. Learn about self pollination here. Why have some plants developed this ability? Cross pollination aids biodiversity, but how are plants adapted to aid cross pollination. Find out how some plants are adapted to be pollinated by wind. Link back from Flower Pollination to Home page.